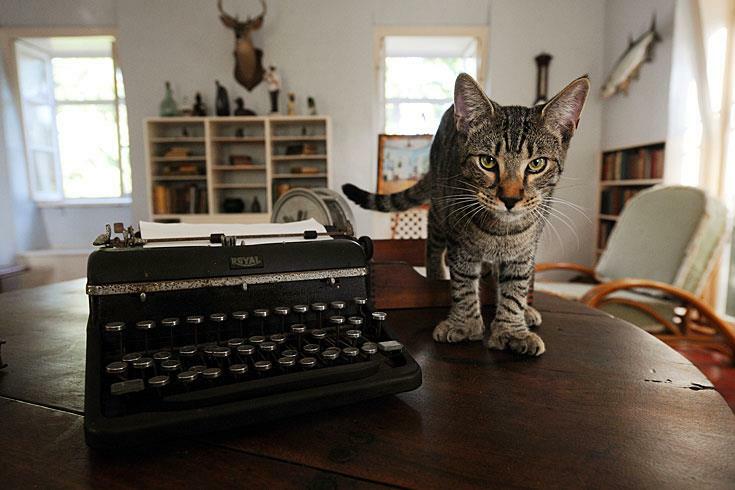 On every visit to Key West, the Ernest Hemingway house is a must-see destination. Granted Mr. Hemingway is a famous author, but my inspiration for visiting is to see the polydactyl cats, the cats with more than five toes. Not just one or two or three, but fifty cats. They live in the house like any other pet cat--basking in the sun on a window sill; lounging on the cool wooden deck; curled and napping on a pet bed, stretched out on the terrace...This is their home and the cats live peacefully on the property accustomed to the hundreds of daily tourists passing through, the stares, the ooohs and aaaahs. You see, Ernest Hemingway left his house to his cats, not his wife. Theirs was not a happy marriage. One learns this nugget of information when you take the guided tour. The cats all have names, usually named after actors or actresses, like Audrey Hepburn who my cat Jean Pierre actually fell in love with (yes I took my cats to Key West and to the Hemingway House--I like to think I'm a cool cat mom). When I read the headline "How the Ernest Hemingway Cats became a Federal Case" my heart sank. "What now?!" I exclaimed. It turns out a visitor was concerned about the "cats' care" and took his or her concern all the way to the federal government, the USDA. Seriously? Sadly this is true. Since the cats are part of a museum, a commercial business, and are live animals, they fall under the federal law of "exhibition animals". So the museum needs an exhibitor license as mandated by the Animal Welfare Act. Well that does not sound so horrible and filing some forms could solve that administrative issue. If only it were that simple. "Federal officials advised the museum that it also needed to take action to: Confine the cats in individual cages each night, or construct a higher fence around the property, or install an electric wire atop the existing brick wall, or hire a night watchman to keep an eye on the cats." Confine cats and deprive them of their born freedom to move around? Install an electric wire atop the existing brick wall? These are not dangerous, untamed, wildlife animals! These are non aggressive house pets! I understand the Animal Welfare Act is intended to protect animals. But these solutions go against the nature of these cats. I can understand constructing a higher fence around the property so the cats do not leave the property and risk getting hit by a car. But cats know where their home is and return. The grounds are expansive, a heaven for outdoor cats. However the other solutions are not humane and lack common sense in my opinion. Hire a watchman? Whoever proposed that must have drowned their coke in rum at the movie theater when watching a Night at the Museum. What will a watchman do? Say "Halt Humphrey [Bogart]--you are not allowed to climb over that wall!" The bottom line of the court case is that the USDA has the authority to regulate the cats since it's part of a business that draws customers from outside of Florida that do come to see the cats. (Interesting, in my experience as a tour guide operator in Miami in talking to tourists on their way to Key West, most do not know that the main feature of the Hemingway house is the cats ). As a pet educator and rescuer, I appreciate the laws intended to protect animals from abusive situations or scenarios that place them in danger. However I also believe the law must recognize the unique nature of each animal. In other words, use some common sense. My burning question is who was this concerned visitor? What is his/her background and expertise in working with pet cats? I'm miffed that my tax dollars are spent on this issue when the cats are well taken care of, pose no threat, and are clearly happy and healthy and bring tourism dollars to my state. Here is the complete story. What do you think? Is the law interpreted too broadly? 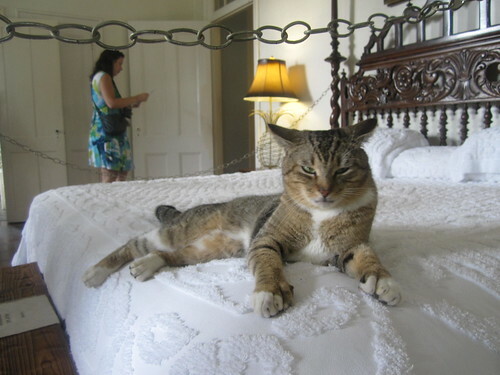 Below is a one minute video that briefly introduces the Hemingway House cats. This soooooooooooo angers me! You are right, what is next???? This is the most ridiculous thing I have ever heard!!!! Purrsonally, between you and me, they are idiots! So sad. Too much government and regulation. Clearly this is something that doesn't need "fixing." I can't imagine putting a cat in a cage at night. A higher fence? Huh? They have a Purrfect Fence already (or DID) (www.purrfectfence.com) Suppose I should actually read everyyhing before I post, but, too late. This is an outrage!! I am too angry and sad. OK what can we do to help? Dash blogs at Dashkitten.blogspot.com and is happy to help circulate any action and activity you might take. We promise (and don't break our promises).